We currently provide a range of rheological (flow) and tribological (friction and lubrication) characterizations for topical products. These measurements are valuable in isolation to characterize critical attributes of relevance to their use. To this we can now add “rheological synergy” profiling to specifically support development of mucoadhesive delivery systems. Following an approach by Madsen et al (1) rheological synergy assessments are performed by measuring properties (typically storage modulus, but potentially other relevant characteristics such as zero-shear viscosity and yield stress) of mucoadhesive and mucin gels, first separately then combined. Figure 1: Proposed synergistic interactions between mucin and mucoadhesive polymers result in greater-than-expected increased in modulus. Some combinations of mucoadhesive polymers and mucin demonstrate a marked increase in modulus when compared to the products when tested separately. This response is proposed to demonstrate macro-molecular interpenetration between mucin glycoproteins and any purported mucoadhesive polymer in the product under test. The results of the test can be presented as absolute or relative rheological synergy to provide an easy-to-interpret comparison. 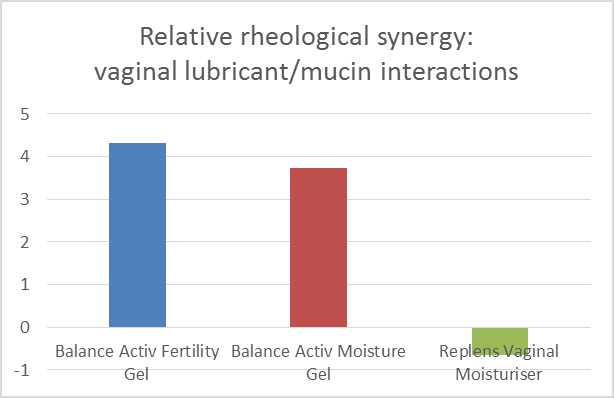 Figure 2: Hyaluronic acid based lubricants (Balance Activ products) display markedly-stronger interactions with mucin, suggesting better mucoadhesion. Figure 2 shows the results of such an assessment on three vaginal lubricants, two based on hyaluronic acid (the Balance Activ products) and one based on carbopol (Replens). The y-axis represents the relative rheological synergy: the ratio of the increase in modulus (on combining product and mucin) to the sum of the moduli of the original components. The results tell us that the hyaluronic acid-based formulations, when mixed with mucin, result in a gel with around four times higher modulus than expected, suggesting a strongly synergistic interaction, whereas the carbopol gel demonstrates formation of a weakened gel when combined with mucin. If you would like to discuss the characterization of your mucoadhesive formulations please contact us. For further reading on this approach you may want to take a look at Madsen et al, A rheological examination of the mucoadhesive/mucus interaction. J. Controlled Release 50 (1998) 167-178.